I can hear you saying it right now – not a whole disk of contemporary music for organ. It’s a daunting prospect, and no matter how much one enjoys a composer’s music a little bit of the sound of the organ is much more than enough for many. These small pieces are what many would consider to be typical organ music, but there’s more to them than that for nothing this composer does is ordinary – there’s always something unexpected in there. Somewhere. There’s a version for wind quintet of the Fantasy and Fugue on Swing Low, Sweet Chariot, Comin’ for to Carry Me Home (1997) on MSR CLASSICS MS 1253 (Chamber Music I) and this is one of the surprises on this disk. For a start, it’s not the kind of tune one associates with this kind of treatment, or this instrument. But it’s a delight, hearing the virtuoso flourishes and putting the tune into an almost baroque setting. The lines are a little clearer in the quintet version but this original version is illuminating. It’s more fantasy than fugue, no problems there, and it puts the tune through many different settings and registrations. 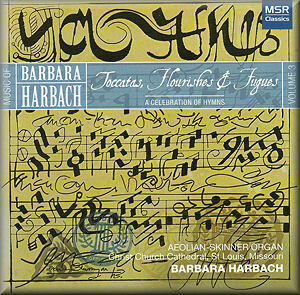 Harbach has long fought for the music of female composers, indeed, she was once told, in the 1980s, by someone who should have known better, that “Women have never composed anything at all, and if they did it certainly wouldn’t be any good!” That misguided person should be made to hear Harbach’s One of Ours – A Cather Symphony (2004) often (MSR CLASSICS MS 1252) and then we could watch him eat his words, with relish. Harbach tells a story concerning the creation of this tune, which, for some reason, she hasn’t recounted in her notes. Sarah Hannah Shephard was a Mississippi slave who faced being sold, and separated from her baby girl, in 1847. She stood on a bridge and contemplated suicide, taking her baby with her thus saving the little one from being sold. It was hearing the words of an old Black woman, who was passing by at that moment, which stopped her: “someday you will be reunited with your daughter”. They were sold separately leaving Sheppard with little hope of ever seeing her daughter again and she wrote Swing Low, Sweet Chariot to help her deal with her despair at their joint situation. 25 years later they were reunited. It’s easy to see why the composer has lavished such attention and care on this tune. The Morning Trumpet is a rather subdued clarion call, but with such beauty and care in both registration and setting. This is a real prize and should be investigated by all organists. The setting of O Waly Waly – my favourite folksong – is quiet, delicate and meditative. The Chorale Fantasy on Ein Feste Burg which follows has an American sound to it – despite the tune being by Luther – in its figuration and ornamentation, and the Finale on Ein Feste Burg is a loud and jubilant postlude. Forest Green is a quiet and restrained setting of O Little Town to Bethlehem and Darwell’s 148th is a spirited setting of Ye Holy Angles Bright. I hope that I’ve given some idea of the range and variety of these settings – it’s pointless going through them all one by one. There is so much to enjoy here but perhaps the pieces are best sampled in small doses for, because of the small time scale – but not musical scale – of each piece, there’s little to grasp at first hearing, so repeated hearings are essential to get to the hearts of these works. And for organists this is a real treat for here are some very interesting and exciting new pieces which would suit any service or recital programme. Try the Gloria, an original composition which Harbach describes as a rollicking Toccata and Fugue. A rollicking piece for organ? Oh yes, you’d better believe it! Harbach is probably better known both as an organist and harpsichordist than as a composer but it is to be hoped that this will change and the three issues, so far, of her music on CD should be going along way to introducing her special art to English audiences. This disk is a fine example of her taste and capabilities in creating music for what is, after all, a fairly limited medium and one which hasn’t been visited too often by contemporary composers. The recorded sound is magnificent. Crisp and clear with a little reverberation but not so much that the music is lost in endless echo, for this full praise must go to engineer Roger Fredrickson for his perfectly placing the organ in the right aural setting. The notes are brief but give a good introduction to the music, there’s a complete registration of the instrument and a list of Harbach’s other organ works. This is well worth investigating for, as always with Harbach, there’s so much to enjoy in her music.